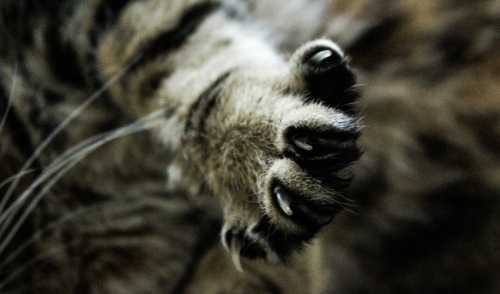 An animal's nails naturally wear down as they are used, but pets often don't get adequate exercise or other activities to wear their nails down as much as needed. If not trimmed regularly, the nails can curve around to dig into the sensitive skin of a pet's foot, causing sores and infections. Ingrown nails are especially common on dewclaws, the nails that are higher on a pet's legs and never touch the ground to wear off naturally. If a pet's toes are malformed or there is a misalignment with the nail, that can also lead to turned and twisted nails that can become ingrown. Some breeds are more prone to nail problems, including long-haired cat breeds, cats with extra toes and dogs such as Dobermans, dachshunds, shar-peis and Chihuahuas. Older pets may also have more brittle nails with different growth rates, which when combined with a less active senior lifestyle, can increase the risk for ingrown nails. When these symptoms are noticed, a quick inspection can determine if there is an ingrown nail. Ingrown nails are generally easy to treat, depending on how far the nail has progressed and the severity of any wound on the pad. Because of the risk of infection and how sensitive a sore foot will be, it is always best to take the pet to a veterinarian for treatment. They will examine the ingrown nail and clip it as needed, cleaning out the wound and treating any infection that may be present. In severe cases or as a precaution against a more serious infection, a course of oral or topical antibiotics may be prescribed. If it is a dewclaw or deformed toe causing the problem, the veterinarian may recommend declawing the pet just on that toe to prevent a recurrent problem. If the ingrown nail has only started to cause discomfort, it may be possible to correct the problem yourself. First, firmly restrain the animal in order to examine the claw carefully. Use scissor-type pet nail clippers or human nail clippers to trim the irregular nail just above where it enters the animal's paw. The tip of the nail may then fall out of the pad easily, or it may be necessary to gently extract it with blunt-tipped tweezers. Clean the pad with mild antiseptic soap to lower the risk of infection, and continue that cleaning 1-2 times per day for several days while the pad heals. Continue trimming the overly long nail by small amounts every few days (the sensitive quick inside the nail will gradually recede as the nail is trimmed) until it is back to a normal, manageable length. Giving your pet adequate exercise on a variety of surfaces, including asphalt, concrete, gravel and other abrasive surfaces, will help keep nails naturally filed, but regular trims will be necessary to avoid overly long nails. Depending on the pet's breed, lifestyle, age and nail condition, trims should be every 4-8 weeks as part of regular grooming. If the pet's toes are misaligned or there is a malformation that creates greater risk for frequent ingrown nails, declawing may be an option to prevent ongoing problems, or those nails may need trimming more frequently. Pet owners should examine their pet's nails regularly to spot any signs of nail overgrowth early before ingrown nails become painful. Trimming long hair on a pet's feet can help make problems easier to see before wounds develop. Ingrown nails can be painful and potentially dangerous for pets, but with proper care, it is easy to prevent these inadvertent injuries. If an ingrown nail does occur, it can also be easily treated and your pet will be stepping out on all fours without problems very soon.